Djokovic's incredible emergence last year, coupled with his three successive Grand Slam final wins over Nadal prior to the most recent instalment (Wimbledon 2011, US Open 2011 and Australian Open 2012), will have certainly put doubt into the Spaniard's mind whether the target was still within his reach. With six slams separating himself and the sixteen-time winner Roger Federer, Nadal could simply not afford to relinquish his dominance of the clay courts in Paris if he harboured realistic ambitions of eclipsing the benchmark set by his Swiss counterpart. Such is the psychological edge that Djokovic has gained over his rival in the last year, a win for the super Serb against the aptly named 'King of Clay' would have unequivocally announced himself as the greatest player on the planet. It would have propelled him to the pinnacle of his career and left Nadal at his lowest point since establishing himself amongst the game's elite. How would have he been able to pick himself up again from such a shattering blow? As it is, Nadal's four-set win (6-4, 6-3, 2-6, 7-5) has ended his Grand Slam voodoo against Djokovic and moved him one step closer to his ultimate dream. Wimbledon is on the horizon, where he has twice been crowned champion and lost out in the final on three occasions, and he will be looking to repeat his feat of 2008 and 2010 when he did the highly regarded 'clay-grass double'. If he does just that on 8th July, he will claim his twelfth slam aged 26 years, one month and five days. Interestingly, Federer claimed his twelfth title aged 26 years, one month and one day. The similarity is uncanny and clearly suggests that Nadal is on course to at least equal Federer's current haul. Federer may still even add to his tally but having hit the dreaded age barrier of 30 and only appeared in one of the last nine Grand Slam finals, it would seem as though his time at the very top of the sport is slowly coming to an end. SW19 will undoubtedly pose a number of questions. 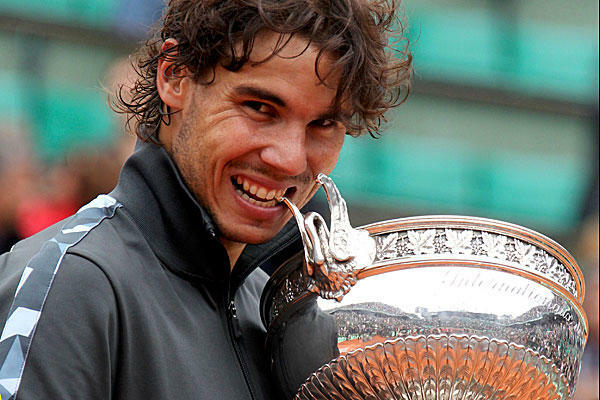 Is Nadal physchologically back on a level playing field with Djokovic or was his victory in the French Open final simply a reflection of his superior ability on clay? Will Djokovic accept his inferiority on clay and maintain the belief that he has the beating of Nadal on grass? Can the six-time champion Federer flourish on his favourite surface and claim his first Grand Slam title since the Australian Open in 2010? The answers to these will tell us a lot about Nadal's credentials in his pursuit of unrivalled greatness. Federer, Pete Sampras and Borg better watch out. Welcome to my blog, Sport of Call. I am an NCTJ qualified trainee reporter with an upper second-class degree in Media and Sports Journalism. I have experienced working for the Manchester Evening News, Manchester United's official website and the press agency Sportsbeat. My aim is to break into the wonderful world of sports journalism sooner rather than later.